Gail Morris has been writing extensively since 1997. She completed a master's degree in nursing at Indiana University-Purdue University Indianapolis and practiced in medicine for more than 20 years. Morris has published medical articles in peer-reviewed journals and now writes for various online publications and freelances for Internet marketers. A bone bruise results from intensive and compressive forces directed at a bone during an injury. Damage to the bone occurs in the interior, or medullary, portion and will often be accompanied by edema and swelling. The types of injuries that cause a bone bruise include falls, car accidents, sports injuries or blows received by other people or objects. Bone bruising can take up to 12 months to completely heal, as demonstrated through MRI evidence. Because bone bruising is often associated with other ligamental or tendon injury, it may be difficult to determine the extent of a bone bruise injury without an MRI. According to Mountain View Pain Center, of Denver, Colorado, bone bruises can become a nagging injury unless adequately treated. The first approach used at the pain center is the application of ice massage. Patients are directed on how to make an ice cup and massage the area for no more than five minutes, several times a day. The purpose is to help decrease the swelling, reduce the pain and begin the healing process. An ice cup can be made at home using a Styrofoam cup. Fill it with water and allow it to freeze. The Styrofoam is easily peeled away from the ice, exposing a half inch of the ice at the top. The patient can now hold the Styrofoam cup and protect his hands from the ice, while rubbing the exposed ice over the injured area. Practitioners at the Mountain View Pain Center will then use microcurrent therapy to the affected area to help treat pain, break up scar tissue and stimulate healing. Microcurrent therapy is also referred to as microcurrent neuromuscular stimulation and uses a small pulsating current of electricity delivered to the body. The theory is that external application of microcurrent will increase the production of ATP, ion exchange, absorption of nutrients, elimination of waste products, protein synthesis and oxygenation. All these processes work toward decreasing the time required for healing. According to the SportsInjuryBulletin.com, bone bruises are often associated with ligamental and tendon damage. Achieving full range of motion in the joints will help patients get back to their original state of health as quickly as possible. Range of motion exercises keep the joints in full motion and inhibit the chance of further scar tissue development. After consulting with the physician or physical therapists, many athletes are able to achieve range of motion exercises concurrently with rest and ice. In a 1998 study published from the Universities of Helsinki and Turku, Finland, researchers reported results that were contradictory to current belief that bone bruising is often associated with ankle sprains. In their study, there was a tendency for bone bruising to be associated with a sprain, but without statistical significance. Bone bruising in the ankle appeared to have a different course than those suffered in the knee. Doctors at the Mountain View Pain Center recommend that their patients also start with supplementation in order to help the body to heal. They use vitamins K, C and A and bromelain to help fight infection, promote bone growth, support the immune system and speed recovery. 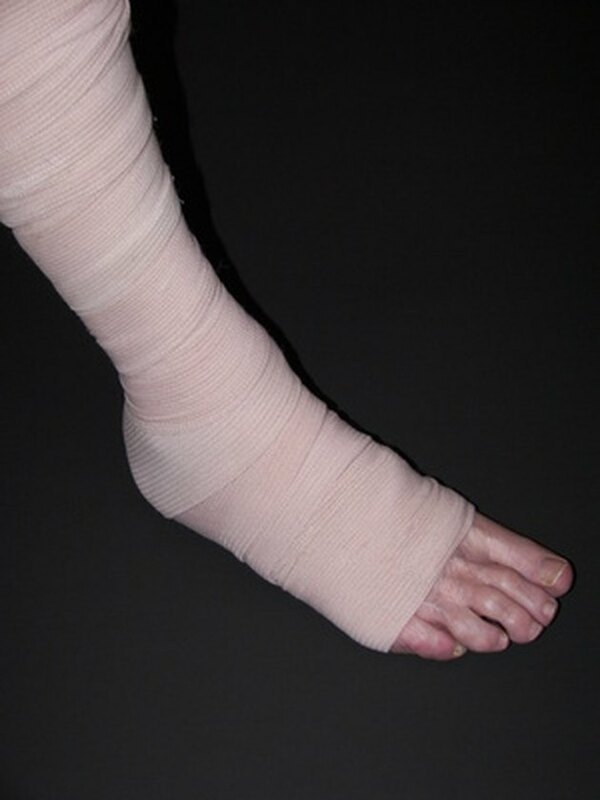 What Are the Treatments for an Avulsion Fracture? What Is a Bone Lesion?